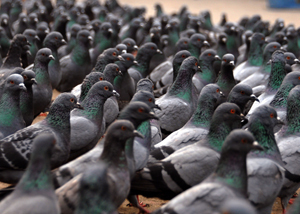 Flocks of feral pigeons have become an increasingly common sight in many towns and cities. They thrive in urban areas in particular because there is usually a good food source and also because of the absence of predators. The result is that they can become pests in built up areas. They have thrived in our cities and towns by adapting to life, roosting and breeding in the seemingly inhospitable environment provided by tall buildings and other structures that provide a small amount of shelter (habitats very similar to the cliff homes of their ancestors). Balconies, flat roofs, ledges, loft spaces and empty buildings are often used if the birds have access. Nests are constructed of twigs but can also contain rubbish such as pieces of plastic; they may even be built on or near the dead bodies of other pigeons. The bird is about 33cm in length and weighs between 280 and 560g average about 350g. Its plumage can vary considerably, from a close resemblance to that of the original rock-dove (with blue-grey plumage, double black wing bars and a white rump) through various “blues”, “reds” and chequered types, to almost pure black. The feral pigeon is capable of breeding throughout the year and nests may be found in any month, however the peak occurs between March and July. Usually, two white eggs are laid on consecutive days. Incubation lasts about 18 days with fledging taking place about 4 ½ weeks later. Their natural food is grain and green vegetable matter but they have survived in our towns by scavenging food and eating almost any foodstuff available such as dropped takeaway foods. This ‘human’ food does not contain the ingredients that the birds require for good health. Furthermore, waste food left down for pigeons can attract foxes, rats and mice. Feeding pigeons attracts them to areas that are not natural to them and exposes them to risks of injury. This is why you often see pigeons with feet and wing injuries. Feeding them also results in all year breeding that causes overcrowding. The birds become stressed and disease and parasites spread quickly within the flock. All wild birds and their eggs and nests are protected under the Wildlife and Countryside Act 1981; under this Act, birds cannot be taken or killed, and their eggs or nests (when in use or being built) cannot be taken or destroyed except under licence. The best way to prevent, or minimise, the nuisance caused by feral pigeons is to control where they roost, nest and feed. One way to do this is to ‘pigeon-proof’ your building. This includes simple tasks like sealing gaps under eaves and replacing missing roof tiles (please remember to remove pigeons prior to proofing works). Total proofing against all birds can only be guaranteed by closing all openings bigger than 20mm in diameter. Pigeons can be deterred from using common roosting sites such as window ledges and roofs by fitting stainless steel wires at the correct height to prevent the birds from landing. Other deterrents to the feral pigeon include barrier gel, spikes and bird repellent gel. Finally, do not put down food to feed the birds nor drop litter (especially food litter).